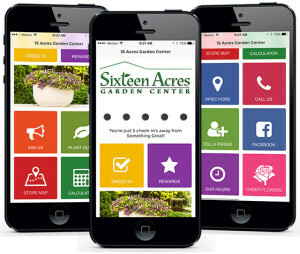 The 16 Acres Garden Center app is designed to help you have more fun in the garden and at our garden center. Each time you visit the garden center your purchase will be validated at the register and you’ll receive another ‘punch’. After 5 punches you’ll earn a reward. Click on the rewards tile and you’ll see all the rewards you’ve earned and all those you are eligible for. 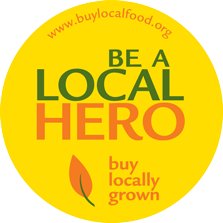 Recipes – We’ve added over 150 tasty recipes to help you take your kitchen garden to the next level. Each season we add new favorites. Tap the ‘Recipes’ tile for instant inspiration. Calculator – We’ve added a mulch calculator to help you determine how much mulch you’ll need for your landscape project. Settings – Make sure to turn your notifications on in order to receive occasional updates or notices. 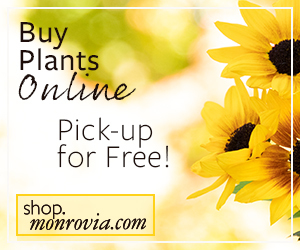 We promise not to bug you, but we will alert you to severe weather or other situations that involve your plants and pets. You can turn notifications off at any time. This tile will also show you if your phone is ‘Beacon Enabled’. 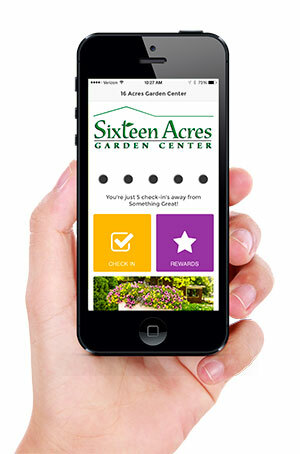 We’ve introduced a cutting edge technology to enhance your experience at the garden center. You’ll need an iPhone 5 or newer and a beacon compatible Android device to take advantage of this feature.